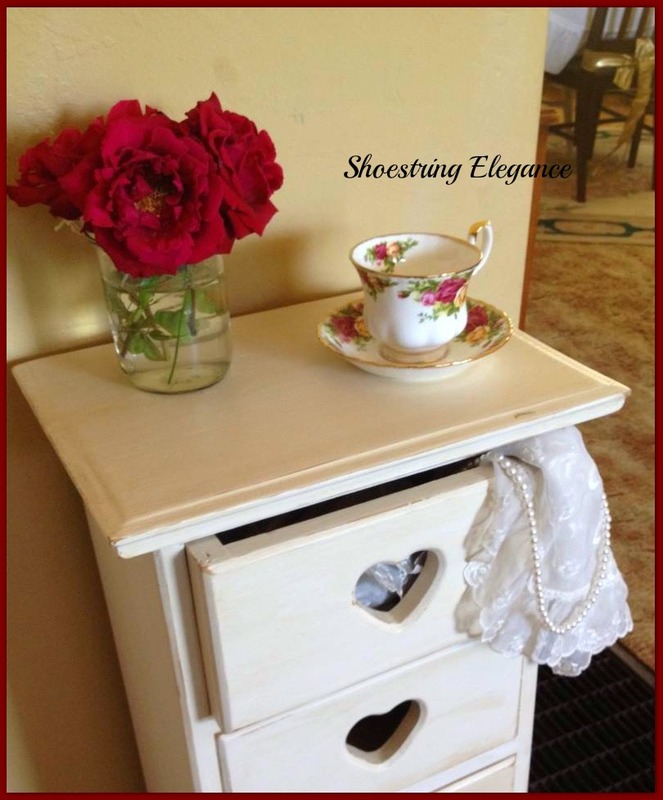 Shoestring Elegance: Garbage To Gorgeous for FREE!! Garbage To Gorgeous for FREE!! Goodness, where do I start? Well, First of all, Let me wish you all, albeit late, A Happy Easter!...Happy Mother's Day!...Hopes that you had a good and safe Memorial Day weekend! Yes, I know, I have been away for a little bit, but that didn't stop me from creating, cooking DIY'ing (probably not a real word, huh?) Either way, I am back at it again and sincerely hope that you have hung in there with me! Ok, let's get to it! Did you see the title? Garbage to Gorgeous for FREE? That's a wonderful fact of this wonderful little treasure that has now become part of my home. 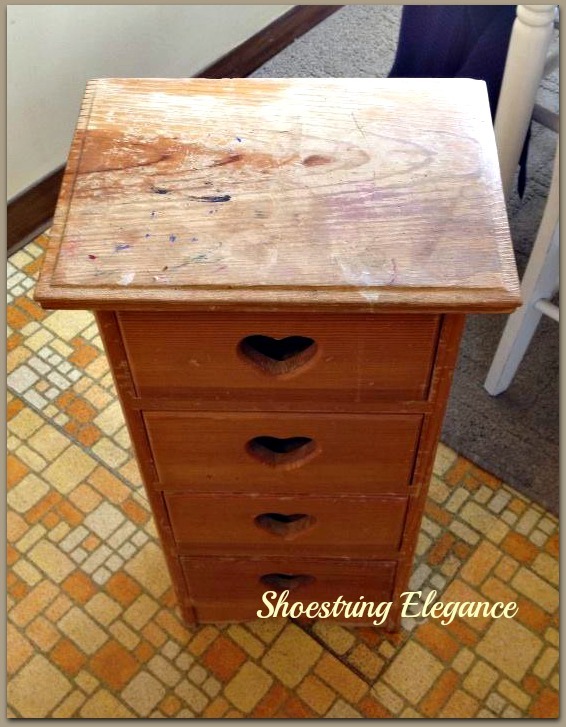 Unfortunately, or fortunately for me, depends how you look at it, this beautiful little dresser was found on my very own street side next to the garbage cans, ON garbage pick up morning! I know, I couldn't believe it either!! In all fairness, it looked nothing like this. So, let me show you how it got this way, after I snuck down in my robe and saved from the garbage truck! What I originally found was this! I know!! Completely different right? All the same solid wood, tattered, stabbed many times (I think they used the top of the poor little thing as a butcher's block) and to top it off some kids had gone to town on it with their large marker pens! 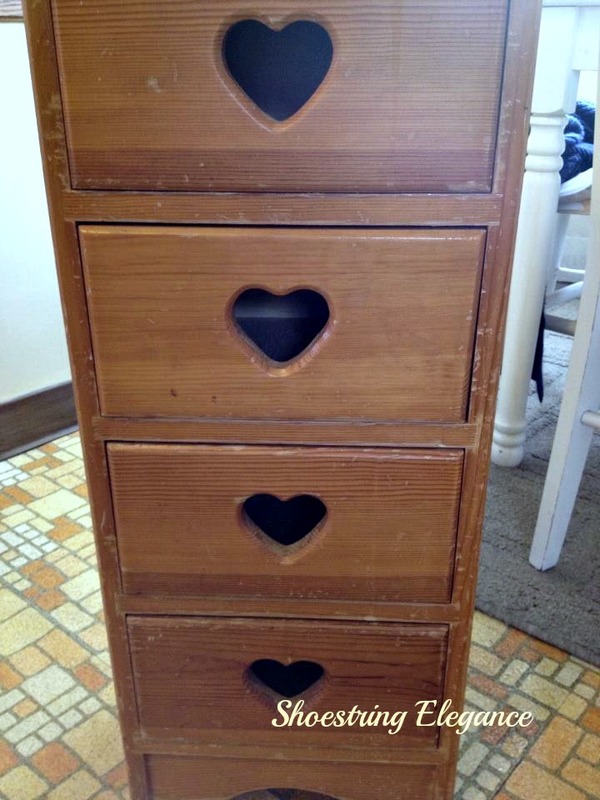 Still, what a cute little dresser. 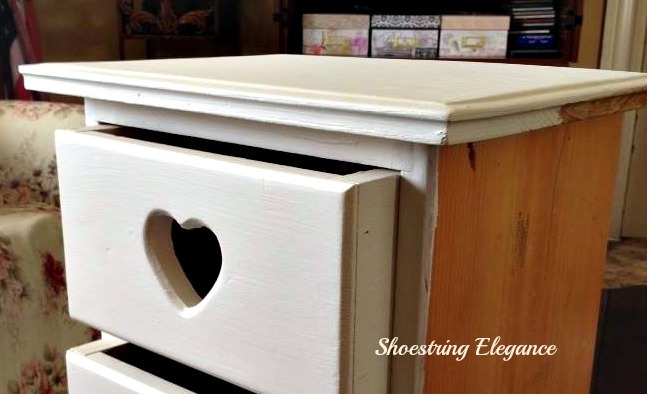 What I usually find at the GW or other thrift store is in good enough shape that chalk paint will cover any imperfections. Not this little one. So, I got out my sandpaper and went to town on the really bad parts and cleaned up the rest. Finally, I was ready to paint!! I was so excited to get to this point I can't even tell you. I have done alot of work with Behr's version of AS Chalk Paint. This time, I was thinking I really wanted this piece to have that authentically antique feel and look. So, I added a little leftover "peanut butter paint" I had on hand, to tint the white into an older creamier white. I was very pleased with the results. 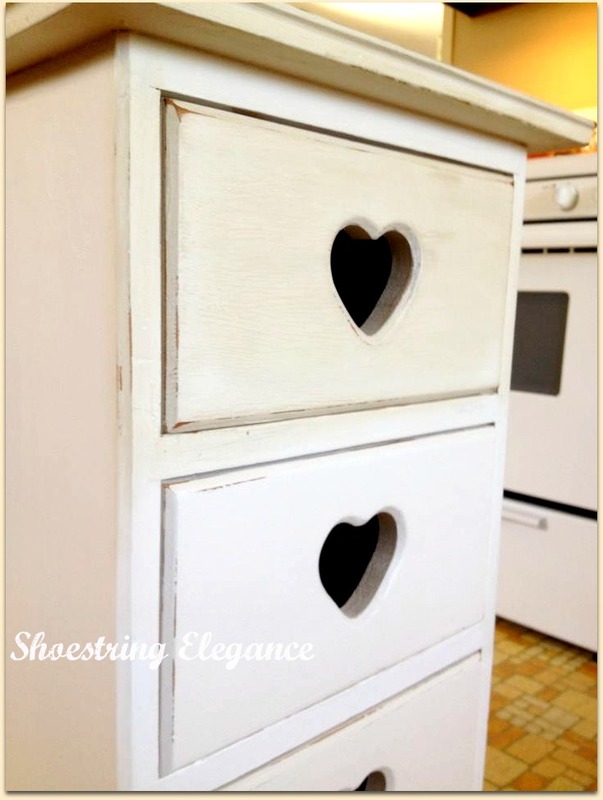 If you are trying this, yourself, I used approximately 1 tablespoon of the colored paint to 8 ounces of chalk paint. The drawers out, I began! Side note here: You are going to notice a little variation in the colors on these images. It's all the same, just the difference of day or night, when the photo was taken. I, rarely, like to use the flash for the images I share with you. 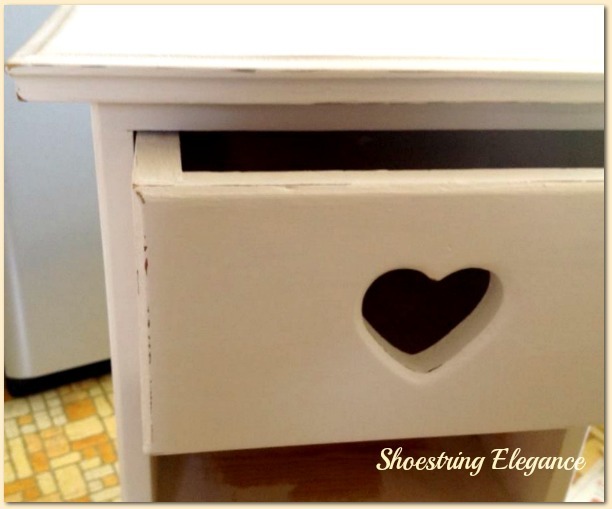 With the drawers and the front done, I slid them back in for convenience. (And to see how it was coming along) Progress + Incentive is a wonderful thing and quickly turns into a motivator to keep on going!! 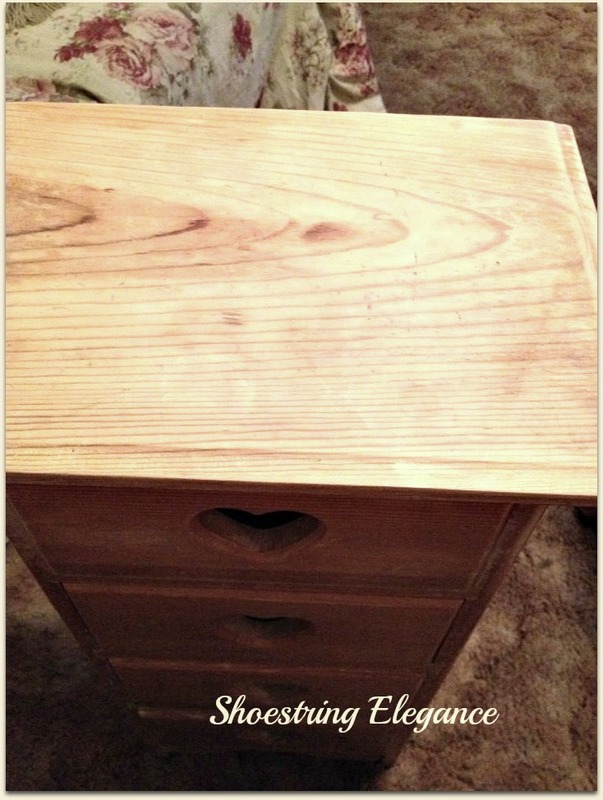 Once the painting was done, it was time to get my finer grade of sandpaper and start "distressing" the dresser, being mindful of where normal where and tear would occur, I lightly sanded the corners and heavily used spots. Because this wood was so blonde, after sanding the stain and varnish off, I decided to rub in some wonderful Old English Dark wood oil, for a more authentically aged piece. I took a picture of it here, with just the top drawer done, so you could really see the difference. By this point, I couldn't wait to see it all done, so I worked on it for another hour or so and ended up with this beautiful little treasure!! I'm so happy with the way it turned out! What do you think? Do you look on the curbs for treasures to make over? I highly recommend it. It is the ultimate in recycling! Plus, no need to spend money, if someone else is, literally, throwing it away! I hope you enjoyed my project as much as I did!! Many more to come. Thanks so much for coming along my journey with me today! Many Blessings to you and yours! 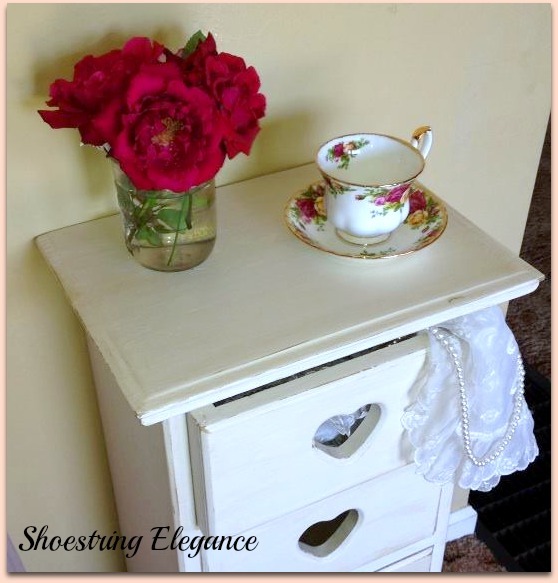 I think this is a very cute little dresser redo. Thanks for sharing it with me. Wishing you a very blessed day! Thanks so much. Lynn. Wishing you the same! Thank you, Kimberly! 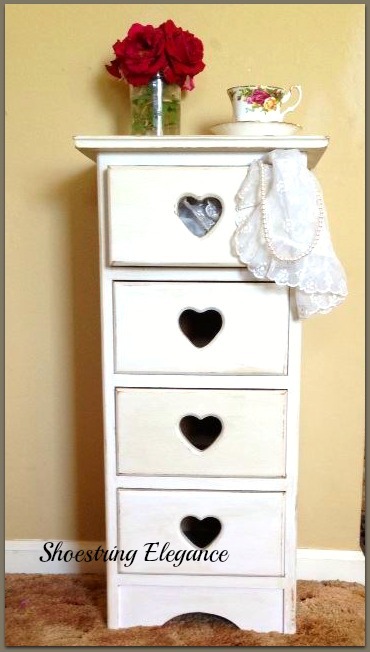 Love the Shabby chic look!! How cute!! It looks so romantic in white! Marijana, Thank you for your kind comment. So glad you found me! Greetings to you in Serbia! Hi I am just stopping by from the click and chat and wanted to say Hi! 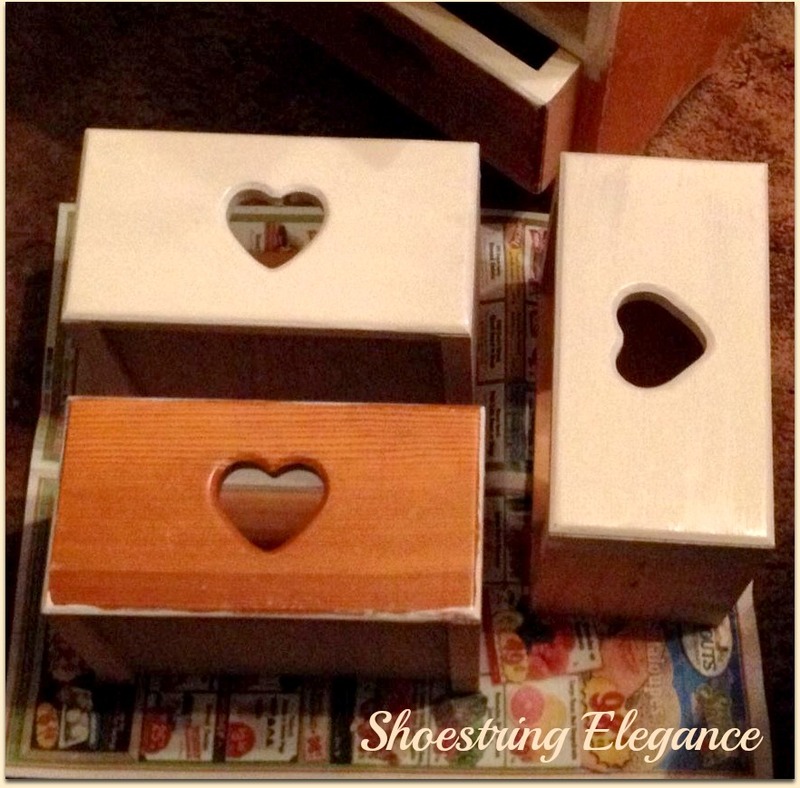 I love this idea of saving garbage and making it into beautiful treasures. What a great piece! Thanks so much, Rena! I'm really happy with it, too!! Thanks for coming by! This is a very cute piece! you can probably use it anywhere! You did a nice job! Great save! I love the Royal Albert china teacup! Thanks so much, Linda!! Yes, you are right it has lived 3 places already, but found it's final resting place next to my bed. You have to love Royal Albert!! Hi, Theresa! Thank you so much!! It's good to be back. I loved joining your party! I hope to again soon! Hey, Kerryanne! Yes, I thought you might like it! Seemed right up your alley! Thanks for having me at your party! Wow, it's beautiful! You did an awesome job making it over! And I love the Old Country Roses teacup and saucer adorning it. I have a friend who has discovered some awesome furniture treasures in her apartment complex's dumpsters. Her latest find was a TV armoire! She refurbished it, and it is simply stunning. People like you and her, who can make-over like that, amaze me. Thanks so much, Patti!! I'm jealous of your friend. o dumpsters around my town. I would love to get and do an armoire!! Your words are so kind and so appreciated. Happy Pink to you too! Thanks so much Meredith!! Yes, the price was PERFECT!!! LOL. Incredibly cute! What a deal. LOL on your sneaking down your street in your robe to the garbage cans to get the treasure!!! So fun to find such treasures. LOL!! I'm sure I make for some interesting talk in my neighborhood! Although, many of my neighbors know me and will show me their "garbage" now before they put it out! That makes me laugh out loud!! Thanks for your kind comment! Oh, Katherine, your kind words mean the world to me!! Thanks you so much!! I'm popping over to leave you some Bloggy Love and pick up one of your Beautiful Buttons!! I'm so glad you liked it as much as I did! Great! Thanks for having mem, Tammy! That looks amazing. You did a great job. I've just pinned your post! Thanks for sharing at the Say G'day Saturday linky party. Hope you can join us again this weekend. Thank you so much, Natasha! I'm so glad you like it! Thanks for the party and the pin!! Popping back to party with you this weekend!